Nosy Be, meaning 'big island' in Malagasy, is located off the northwest coast of Madagascar and is a must for all visitors to the country. It is home to Madagascar's busiest and largest tourist resorts and a good destination for a romantic beach getaway. 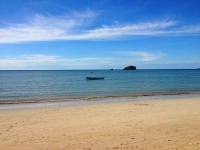 Featuring spectacular beaches such as Madirokely, Belle Vue and Andilana, Nosy Be also has some impressive coral reefs, which make it a popular choice for scuba divers and snorklers. The island is also known for its vast tropical forest teeming with wildlife. The Lokobe Natural Reserve offers fantastic bird watching opportunities and a large variety of animals. Nosy Be also offers volcanic lakes, great hiking and mountain biking trails, rum distilleries, Ylang Ylang plantations and, the four-day Donia Music Festival in May. Visitors to Madagascar often don't venture far beyond the beautiful island and it isn't hard to see why. Although it can get crowded, Nosy Be still has a sleepy, laid-back atmosphere, unspoilt by mainstream tourism. We are looking for contributors for our Nosy Be travel guide. If you are a local, a regular traveller to Nosy Be or a travel professional with time to contribute and answer occasional forum questions, please contact us.